The Brochure Stand A3 Podium is factory complete from metal steel. Furthermore, all items receive an epoxy coat in black colour. The Brochure Stand A3 Podium include as a result a clear perspex overlay. The offer include with or without full colour print. In addition, units can be factory complete to suit requirements. Brochure Stand A4 Z Up is steel constructed and epoxy coated in silver colour. 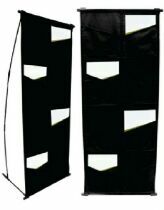 The system comprises of three double sided A4 tiers and is supplied with a carry bag – fully collapsible and compact. The Brochure Stand A4 Z-Up can be customised to requirements but subject to quantity. 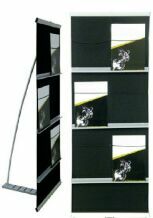 The Brochure Stand Econo Double Volume includes a durable fabric backing with top and bottom aluminium profiles, three double A4 tiers (2 across x 3 up), weighted base, pole and carry bag – fully collapsible and compact. Custom sizes are available on request although dependant on quantity. 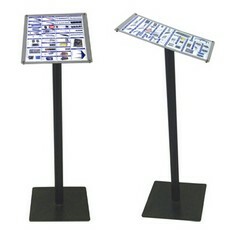 The Brochure Stand Econo Double Volume can be customised to requirements but subject to quantity. The Brochure Stand Econo Single Volume includes a durable fabric backing with top and bottom aluminium profiles, three A4 tiers (3 up), weighted base, pole and carry bag – fully collapsible and compact. Custom sizes are available on request although dependant on quantity. The Brochure Stand Econo Single Volume can be customised to requirements but subject to quantity. The Brochure Stand Econo Plus Mesh include a durable mesh backing with top and bottom aluminium profiles, four double A4 tiers (2 across x 4 up), weighted bases, poles and carry bag – fully collapsible and compact. The Brochure Stand Econo Plus Mesh can be customised to requirements but subject to quantity. Brochure Stand Executive is steel constructed and epoxy coated in silver colour. The system comprises of ten tiers and is supplied with carry bag – fully collapsible and compact. The Brochure Stand Executive can be customised to suit requirements but subject to quantity. The Brochure Stand Line Up is steel constructed and epoxy coated in silver colour. The system comprises of four tiers and is supplied with a carry bag – fully collapsible and compact. 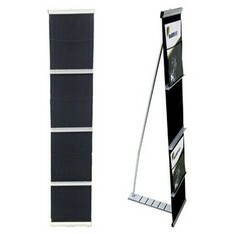 The Brochure Stand Line Up can be customised to suite requirements but subject to quantity.